5/13/2016Share this story on Facebook! Journalism majors are required to take a series of hands-on skills courses that will prepare them for internships and jobs in print, broadcast, and online journalism. From their first semester on campus, most journalism students take advantage of opportunities to work in student media. As the nation approached the countdown to the 2016 presidential election, all eyes were on the competition between the potential Republican nominees, including Donald Trump, and the potential Democratic nominees Hillary Clinton and Bernie Sanders. I was one of nine students from Ithaca College’s Roy H. Park School of Communications selected to help NBC News cover the South Carolina GOP presidential primary on February 20. 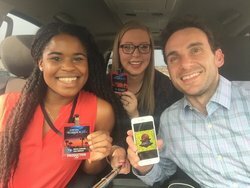 Students were selected by two journalism professors to travel to South Carolina to provide content for NBC News regarding millennial voters and the upcoming elections. 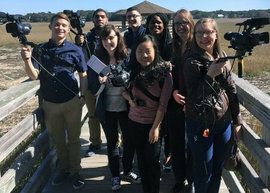 We students worked alongside professors James Rada and Anthony Adornato to film oral histories of the local African American Gullah people and produce content for various media platforms, including an NBC Nightly News broadcast, Instagram, Snapchat, and elsewhere online. In the South Carolina Lowcountry, the Gullah people work to preserve their rich but fading culture. And the social and economic conditions of the region played an important role during the GOP presidential primary. The first two days we stayed in Port Royal, South Carolina to collect oral histories of Gullah people at the Penn Center, one of the country’s first schools for freed slaves, and the Mitchelville Preservation Project, a famous Civil War site where freed and escaped slaves lived. We documented the rich Civil War history of the region and learned about the socioeconomic issues that the people consider during the upcoming presidential election. Many considered education reform, better access to health care, and more infrastructure, such as roads and transportation services, to be most important when casting their votes for the next president. While many of the individuals I interviewed mentioned these issues when asked about their political views, the majority did not state which political candidate they favored. Rather, a number of Gullah people said they aligned with the views of the Democratic Party. 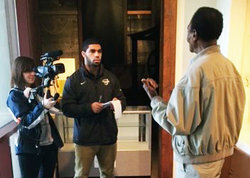 For Kyle Stewart ’18, the trip served as an opportunity to practice the reporting techniques he’s learning as a journalism student at the Park School. He said covering the primaries allowed him to experience real-world journalism. The last half of the trip, we traveled to the state’s capital, Columbia, to shoot footage for NBC News, take over the Instagram for NBC BLK, the NBC black culture website, and speak with college students about the presidential primary and voting. My fellow IC students and I divided into two teams, with one visiting the University of South Carolina and one traveling to Claflin University, a historically black university about 40 miles away. At each site, we interviewed students of color to hear about their political views and their thoughts on the importance of voting. For the majority of college-aged Millennials, this upcoming election will be their first time at the polls. Many of the students we interviewed supported Democratic presidential candidate Hillary Clinton. Students in favor of the Republican Party supported John Kasich. There were many aspects of the trip that students enjoyed, and for Sydney O’Shaughnessy ’17, her favorite part was speaking with other college students about their political views because she liked hearing the opinions of someone similar in age to her. Also a journalism student at the Park School, O’Shaughnessy said she loved the intense and high-paced environment the trip provided. We also split into three teams on February 20, the day of the presidential primary. One group took over the NBC News Snapchat, another group edited and reformatted content for various media platforms, and another worked with a news reporter to shoot footage for the night’s newscast. My experience in South Carolina allowed me to utilize my journalism skills and work with a dedicated team to help provide content for NBC News throughout the weekend.